Willetts agreed to come out to meet us, so students and staff put some searching questions to him regarding government policy on fees and university funding. (His answers were less than convincing). “I’m here on behalf of UCU – the University and College Union – the largest trade union for staff in the post 16 education sector in the UK. We have 120,000 members in FE colleges, Universities, Agricultural Colleges, Prisons and Adult education. We are educators, researchers, librarians, technicians, IT staff and administrators. We work in different places but what UCU members have in common is that we are passionate about education. This country has University education and research that is the envy of many other parts of the world. We deliver far more with fewer resources than many of our competitors. This government is systematically cutting investment in Universities. Worse than that David Willetts desperately wants to privatise higher education because of his misguided belief that markets make everything better. David Willetts wanted to remove the barriers to private companies in higher education. He wanted private companies like Kaplan and Pearson to give out degrees. These for-profit organizations already have a grip on education in the US. For-profit higher education in the US is poorly regulated but has access to lucrative publicly subsidised loans. These companies target poorer communities and they sell their education with the promise of fixing the students up with loans. They hire part-time staff – often not academics – teach predominantly online, and deliver a very narrow range of vocational courses. This nets the companies huge profits. But it is not higher education. It is not even cheap. A US Educational Trust report showed that it costs more than twice as much to enrol at a for-profit college as it does to in a public institution. Average debt for such these students is over $30,000 compared to less than $8000 at public institutions. Graduation rates are low – 22% compared to 55% in public institutions. I am delighted that plans to allow private for-profit companies access to publicly-subsidised student loans here have been shelved at least until 2015. UCU led the campaign against these proposals in the higher education bill. 500 academics wrote to the Telegraph in December calling on the government to scrap the plans. Collective action, demonstrations like this one, matter. They show this government that we oppose their polices to privatise education. If we act together we can stop them. Apparently the Lib Dems were especially unhappy with the proposals to let for-profit providers into higher education. They voiced their concerns in an early day motion in the House of Commons. Perhaps they acted for fear that the general public will never vote Lib Dem again because of their failure to stand by their promises on higher education. Which reminds me why I am really really angry with David Willetts and his Tory-led government and their Lib Dem partners. The lifting of the fees cap from October means students here will pay £9000 a year to study for a degree. These fees are the third highest in the world (only USA and Korea pay more). Our students will leave their studies with an estimated £50-60,000 debt. We have seen applications drop nationally and locally. High fees mean that people will be denied the life changing, enriching and rewarding experience that I was privileged to receive (and which Willetts and Cameron and Clegg had). Young people from this City who happen to be from poorer families will not go to University. 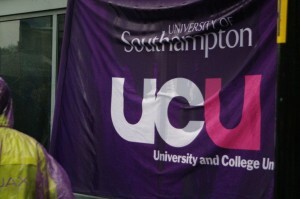 Mature students – people who lost their jobs thanks to Southampton Council cutbacks or the retrenching of local businesses – will miss a chance to upskill or retrain. This University will be poorer for missing out on developing those minds for the future. UCU are against £9000 fees for higher education. This ‘new’ fee income isn’t extra money. These fees simply replace the money the government took away from the University block grant. Every University is having to try to deliver more with less money. This means cuts to degree programmes (Sports Education, undergraduate Social Work have been lost here). It means cuts to jobs (we lost 200 jobs to voluntary redundancy last year). Higher tuition fees will not deliver more, or better, education. This government is taking away opportunities for the next generation and generations after that. David Willetts please go back to your colleagues in government and tell them what you have seen today. A great University. Brilliant staff and students. Privatisation and high fees will destroy everything you have seen. Please stop. ‘Come Clean’ NUS day of action on March 14th. The National Campaign Against Fees and Cuts is calling for maximum turnout for ‘Come Clean’, the NUS day of action on March 14th. Under the new fee regime students will face a lifetime of debt. Despite calls from MPs to delay changes to the university admissions process, he has gone ahead with plans that will favour better off students at entry and force universities into ruthless competition for places with each other. Some universities will go to the wall as a result. The government wants to drive down costs to make it easier for private companies to feed off public education – this is why staff are fighting to defend their pensions. Willetts’ plans for higher education are modelled on Andrew Lansley’s plans for the NHS. So far, over 20 000 people have signed a ‘no confidence’ motion in Willetts. The withdrawal of his Higher Education Bill shows that even the government lacks confidence in him. The National Union of Students has called for a national day of walk-outs on 14 March. This is an opportunity for staff and students to rally to the defence of our education. The government is vulnerable to pressure – now it’s time for all those who are opposed to the marketisation of education to call for Willetts to go.